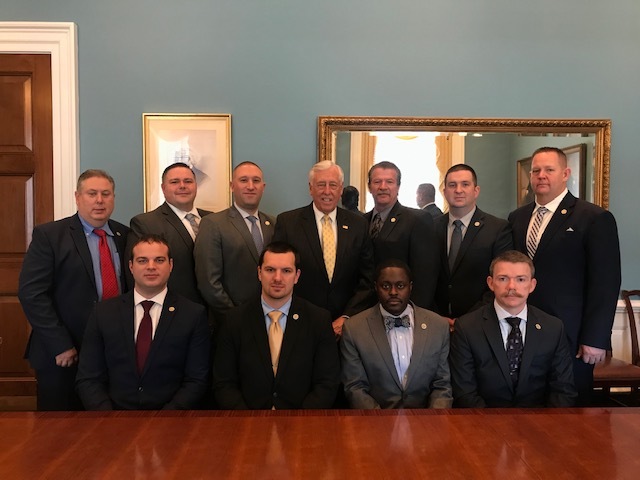 WASHINGTON, DC - This afternoon, Congressman Steny H. Hoyer (MD-05) met with representatives from the Maryland affiliate of the International Association of Firefighters – the Professional Firefighters of Maryland. "I appreciated the opportunity to meet with career Maryland firefighters and paramedics today to reaffirm my strong commitment to ensuring they have the tools they need to keep our communities safe," said Congressman Hoyer. "Day in and day out, firefighters put their lives on the line to protect Marylanders, and we must keep the faith with them. As Co-Chair of the Congressional Fire Services Caucus, I will continue to work with my colleagues to fund the AFG and SAFER Grants programs and equip our firefighters and paramedics with the resources necessary to do their jobs safely and effectively."